- March 2019: NSRC co-sponsors Internet2 Fellowship recipients to attend the 2019 Internet2 Global Summit held in Washington, D.C. from March 5-8, 2019. - February 2019: Michael Foley, World Bank (retired), made mention of the NSRC in his keynote speech for the South African Centre for High Performance Computing National Conference. HPC Wire posted a related article "Framing a Case for NRENs in the Longest Last Mile" by Elizabeth Leake. - October 2018: NSRC Assistant Director Hervey Allen gave a keynote talk in Spanish on Experiences and Strategies Working in the Less Connected World [PDF | Video] as part of the LACNIC30-LACNOG2018 meeting held in Rosario, Argentina. - May 2018: A follow-up story on NSRC-Internet2 Fellow Magreth Mushi and her experiences at the 2018 Internet2 Global Summit in San Diego, California. - May 2018: NSRC - Internet2 Fellows Announced for 2018 Internet Global Summit in San Diego, California. - May 2018: NSRC presented a poster during the Internet2 Global Summit held in San Diego, California includes a case study of working with the Bhutanese Research and Education Network (DrukREN) in 2015 as well as training statistics since 2010. The poster covers NSRC activities from 1992 through 2017. - May 2018: A nice article on NSRC partners working together to leverage the human networks to build Research and Education (R&E) networks. - March 2018: The In The Field blog has published a feature on, "The power of empowering: building network expertise in Asia-Pacific." - January 2018: In a message to the People Centered Internet coalition, Chairman Vint Cerf called NSRC "the gold standard when it comes to preparing groups to build and operate networks that are part of the Internet." Read the article here. - November 2017: The NSRC, University of Hawaii and many other partners assisted the University of Guam as they launched their new Ultra-High-Speed GOREX Network to promote increased growth and effectiveness of data-intensive and highly collaborative research and education activities engaging the Asia-Pacific region with the global R&E community. - November 2017: An article published by the University of Ashesi in Ghana that covers an NSRC direct engineering assistance engagement from this past June. NSRC contractors Brian Candler, Patrick Okui and Sebastian Buettrich as well as NSRC volunteer Bob Rotsted joined the effort in conjunction with University of Ashesi network staff from June 12-16 in Berekuso, Ghana. - October 2017: The London Internet Exchange (LINX) has published an interview (online | pdf) with NSRC collaborator Dr. Philip Smith discussing the formative years of LINX (1994-1997) and his participation as well as links to several talks that he gave while participating in the LINX98 meetings and workshops. - August 2017: Tic & Telecom posted an article on the launch of Senegal's Internet Exchange Point (IXP) on Tuesday the 29th of August 2017 in Dakar. This launch will improve the internet traffic quality in Senegal as well as and promote the development of the digital economy. - May 2017: The Corporation for Education Network Initiatives in California (CENIC) posted an article on the Power of Human Networks and Global R&E here. A video recording of NSRC CENIC panelists Kennedy Aseda (National Research and Education Network of Kenya), John Peterson (University of Guam) and Steve Huter (NSRC) is available for viewing. - May 2017: Internet2 posted a response from NSRC-Internet2 Fellowship Recipient Sarah Kiden on the experience of attending and presenting at the Internet2 Global Summit in Washington, D.C. Read the blog post here. - Apr 2017: The Corporation for Education Network Initiatives in California presented the Network Startup Resource Center with the 2017 Innovations in Networking Award for Broadband Applications. Read the full article here. - Mar 2017: INASP reveals collaboration with African research and education networks meant to advance Accessing and contributing to global research. - Mar 2017: CENIC has announced an award to be presented to NSRC in recognition of work to improve network infrastructure, facilitate collaboration, and build professional capacity in countries around the world. - Feb 2017: GÉANT has published an article on their collaboration with the NSRC to build a video training library on identity management, its technologies and benefits. NSRC team and the Senegalese National Research and Education Network (snRER) working together to establish a gigabit wireless link. - Jan2017: ESnet has published an article on their collaboration with the NSRC to create a set of training videos dedicated to educating network engineers around the world on Science DMZ network setup and architecture. - Dec 2016: University of California Office of Internet Technology has published an article on the efforts of NSRC to build up the global research and education network. - Oct 2016: GÉANT has published an article on the collaboration of NSRC and GÉANT. - July 2016: ESnet has published an article on the collaboration of NSRC and ESnet on the creation of a series of training videos about perfSONAR network measurement tools. - June 2016: Joe Abley wrote about the NSRC's involvement with Internet expansion and education in Africa in a recent blog post. - Sept 2015: The Carnegie Corporation published an article on the NSRC's involvement with Internet Access for Higher Education in Africa. - July 2015: The National University of Samoa (NUS) published an article on the NSRC's technical assistance with the campus network and the donation of distribution switches by Victoria University of Wellington (VUW). - Apr 2015: Internet2 has published a news article on the efforts of NSRC to bring high-speed network access to the research and education (R&E) community of Bhutan. - Mar 2015: The International Centre for Theoretical Physics (ICTP) has published a press release on a new project supported by the NSRC. - Apr 2014: The Internet Society (ISOC) recognized Steve Huter in an April ceremony. The Oregonian newspaper also covered the award. - Jun 2013: An MoU signed between DANTE and NSRC to formalize cooperation in support of connecting the least connected. - May 2013: The award was given at the 2013 Internet2 Annual Meeting held in Arlington, Virginia. - Apr 2013: Hutt News from Wellington, New Zealand ran a story by Dean Pemberton on the NSRC Campus Network Design and Operations Training Workshop held at the UCSY campus from March 4-8 in Yangon, Myanmar. You can view a copy of the story here (PDF). - Apr 2013: The Caribbean Knowledge and Learning Network (CKLN) published a story about a recent workshop on Routing, Peering and Network Management and Monitoring the NSRC ran in February of 2013. - Sep 2012: The training took place at the Univesity of Oregon with the NSRC and Knight Library Staff. You can read more about it here. - Apr 2012: Randy Bush, NSRC Founder, was inducted in to the Internet Hall of Fame in Geneva, Switzerland on April 20, 2012 for his contributions to the global growth and use of the Internet. Press release is here. - Apr 2012: The NSRC helped to assist Cambodias scientists take major digital step; Cambodia links to TEIN3 via Vietnam. - Nov 2011: The NSRC recently assisted the SolarNetOne solar-powered network connectivity project to ship equipment to Kiribati in the South Pacific. Read more about SolarNetOne here. 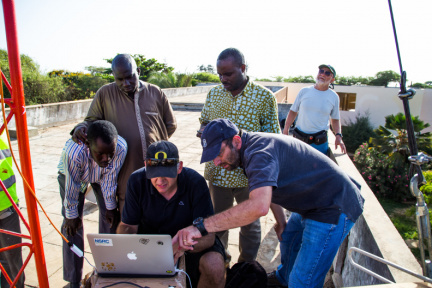 - Oct 2011: The NSRC recently assisted with the deployment of a new L Root server in Dakar, Senegal. A press release from ICANN is available here. 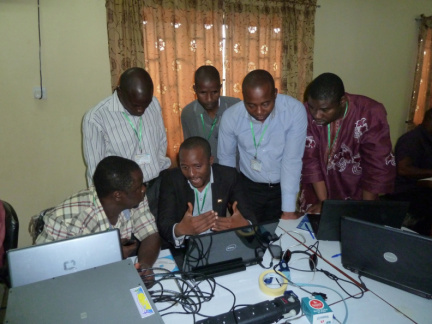 - July 2011:The Nigeria ICT Forum has written about the Campus Networks and ngREN Design Workshop that took place at the Obafemi Awolowo University, Ile-Ife, Nigeria. - Apr 2010: The EDUCAUSE Review carried a story talking about some of what we do: Cultivating Global Cyberinfrastructure for Sharing Digital Resources. NSRC assists with Haiti relief efforts. - Feb 2010: The NSRC has been involved in assisting with Haiti relief efforts. Here is one story about an Android phone in the earthquake in Haiti. Facebook assists with Haiti relief efforts. - Feb 2010: The NSRC has been involved in assisting with Haiti relief efforts. You can read more about Facebook messages assisting people in the earthquake in Haiti. - Nov 2009: BBCAfrique.com, part of BBC radio, aired a story (mp3 format) about the WirelessU-NSRC-ISOC wireless workshop held in Cotonou, Benin from 9-13 November. "Make It, Break It and Do It All Over Again"
- Sep 2009: University of Oregon College of Arts and Sciences Newsletter (CASCADE): "Make It, Break It and Do It All Over Again". "SolarNetOne: Solar-powered networking for anyone"
- June 2009: IBM's developerWorks featured a story on: "SolarNetOne: Solar-powered networking for anyone", a project supported by the NSRC. - Nov 2008: Cisco Press donated books to the Workshop for America Latina y Caribe (WALC), run by the NSRC and Escuela Latinoamericana de Redes (EsLaRed) in November. You can read the press release here. - Aug 2000: Ed Stephenson of O'Reilly Media wrote about NSRC efforts to provide internet assistance and building the human network. - May 2013: The United States Telecommuncations Training Institute (USTTI) has an entry on their Board Member's blog written by Aparna Sridhar, Policy Counsel, Google Inc., "Working Together to Improve Internet Access in Emerging Markets." - July 2012: The NSRC and the University of Hawaii have been awarded an NSF EAGER grant, number 1239824 titled, "Research and Education Networking in the Pacific Islands and Beyond: Exploring and Developing Approaches." - Mar 2011: Google's gifted several organizations: google.org Blog. - Mar 2011: Google this: University of Oregon center gets $1.25 million. - July 2011: The Google Africa blog with Jens Kuehlers, Technical Program Manager at Google Africa, provide a first-hand report on Building a high-performance Nigerian Research and Education Network (REN). 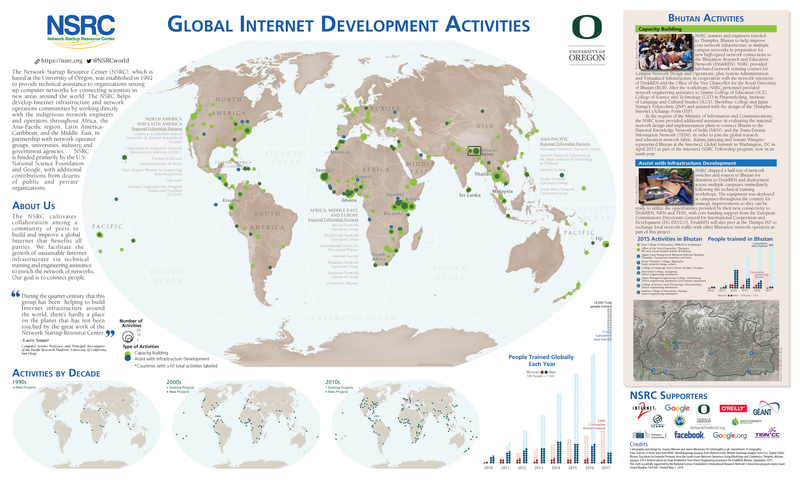 - Mar 2011: Communications of the ACM posted an article "With Google's Gift, U. of Oregon Expands International Cyberinfrastructure". - Mar 2011: UO President Richard Lariviere wrote about, Google supports the NSRC.